At Quattro Foods we like a drop of sauce – but only the most interesting, tangy, colourful and delicious sauces! Our team of chefs spend their days cooking up a storm and the rest of us are always looking for an excuse to wander into the buzzing kitchen and enjoy the gorgeous aromas of their latest creations. Our talented development chefs believe that you can enhance any basic food with an interesting sauce. They’ve got a point. What’s a chicken breast or a piece of fish, alone in the middle of a plate? Very dull, that’s what. But drizzle it with a delicious dressing or simmer it in a sumptuous sauce and you’ve created a mouthwatering meal. And that’s exactly what we offer at Quattro Foods. As a leading sauce manufacturer and supplier we make foods to enhance foods. Our customers in the retail, wholesale and high street sectors enjoy our products as part of their existing menu plans and food products. In other words, we bring their food to life! Take a bag of fresh tomatoes, sauté them with some garlic and onion, add tangy basil leaves and you have a beautiful Italian pasta sauce. Easy? Not quite…. It’s taken our experienced chefs many years to perfect their art. First they have to chat to the customer in great depth to find out exactly what they’re looking for. Once they ascertain the exact needs of the end user (usually high street customer or restaurant diner), they start putting together some ideas for sauces and other menu enhancements. And then comes the really fun part. Sourcing ingredients (the best and the freshest of course) and adding a dash of creativity to concoct fabulous and fascinating sauces. Winter is one of the most interesting times of year in the Quattro kitchen. Can you truly enjoy turkey without gravy and cranberry sauce? We think not. In the run up to Christmas our customers want to offer their customers interesting food that will sell well, and will be enjoyed over the festive season. We had loads of fun with bespoke winter soups, sauces and stews this year, and our unique coconut porridge was an unparalleled hit. It fills us with joy when we hear our customers raving about our products. We know what we love to eat and to cook, and we love to make you happy through our imaginative food combinations. Our Lobster Bisque, Creamy Crab and Pork & Prosecco Pasta Sauces were Christmas best-sellers. It’s always fun taking on a seasonal challenge and our creative chefs certainly rose to the occasion. Of course what our customers eat is the food service end-game, but our chefs are fully aware that food is not just about taste. A plate should look fabulous and smell enticing before it will whet your appetite. And herein lies one of our strengths. Creating colour and drama with our sauces is the result of bright ideas, fresh ingredients and perfect execution. Tasty, colourful and convenient – Quattro Foods sauces are the perfect accompaniment to salads, fish, vegetables, pasta and meat. As a leading UK based sauce manufacturer we scour the globe for food inspiration. For our customers looking for an international twist on their menu plans, we bring a taste of Italy, an Asian aroma or a Creole kick to the table. Taken from the Latin ‘Salsa’, the word sauce implies taste vitality. 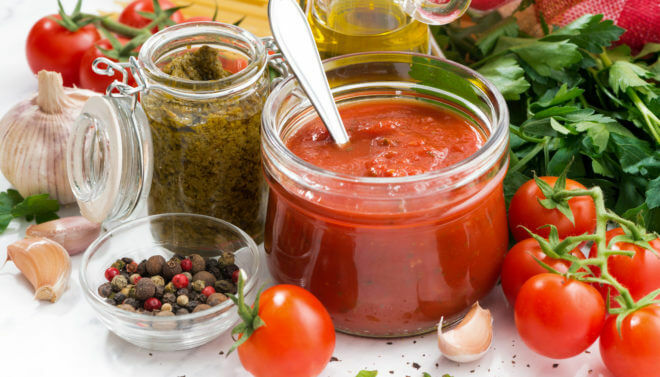 Simply let us know what your customers like and we will concoct a sauce to take their food to the next level of culinary bliss. There is even evidence to suggest that adding a bit of spicy sauce to your meal can be beneficial to your health. “The bottom line is that any kind of vegetable material you consume will improve your health,” nutrition expert David Popovich from Massey University in New Zealand told TIME magazine back in 2015. Scientists believe that capsaicin, found in hot pepper, promotes a process known as apoptosis – programmed cell death that leads to a higher turnover of cells in the human body. This process is said to slow the progress of cancerous cells. José de Jesús Ornelas-Paz from the Research Centre for Food and Development in Mexico believes that the benefits come from the whole chili pepper – not just that one active ingredient. “Peppers are a cocktail of bioactive compounds,” he said. A team from Harvard University assessed the health of almost half a million Chinese adults in a 2015 study and found that those who ate spicy food six or seven times a week had a 14 percent lower mortality risk than those who hardly ever indulged. So if you’re a spice lover, go crazy on the sauce – science is on your side! Sauce is a hot favourite set to stay at the top of food-lovers shopping lists. It doesn’t need any celebrity endorsement, but it gets a mention in the gossip columns anyway! King of pop Ed Sheeran has been rumoured to carry a bottle of Heinz Tomato Ketchup “wherever he goes”. He’s such a massive fan of the world’s favourite sauce that he has a tattoo of the eponymous red bottle and he carries a bottle to improve his meals in any time zone. So sauce is here to stay, and the Quattro chefs have already started throwing around tasty ideas for our Spring and Summer repertoire. Now all we need is a little bit of sunshine – watch this space!